Banffshire & Buchan Coast SNP MSP Stewart Stevenson has highlighted new analysis showing that almost three-quarters of peers created since the UK election in May are ‘party insiders’ – including former MPs, Special Advisers or party aides – and has called on Jeremy Corbyn to honour his commitment to not appointing any new peers until the House of Lords is reformed. Since the General Election 62 new peers have entered the House of Lords, including four new hereditary peers and two bishops. 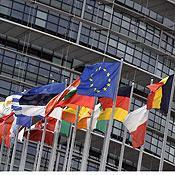 However, by far the biggest group of new peers are retiring, former or deselected MPs and MEPs – 28 of the total. Four former UK Government Special Advisors and a number of Conservative party officials have also been introduced to the House of Lords. In contrast, only four academics and two third sector figures have become peers over the same period. “Supporters of the unelected House of Lords often argue that it allows expert, outside experience to scrutinise legislation – these figures put lie to this myth and show that it is nothing more than a house of cronies. “The facts speak for themselves – House of Lords appointments are overwhelmingly being used to reward loyal politicians and advisors or as a consolation prize for losing elections. It is beyond belief that this is tolerated in a democratic country. “The SNP has never, and will never, accept seats in the unelected House of Lords. Prior to his election as Labour Leader Jeremy Corbyn backed an SNP call for parties not to appoint new peers until the House of Lords is reformed – he must honour this commitment. A long-standing supporter of the Scottish National Party in Buchan has been presented with Honorary Life Membership of the party. Mr Bob Ritchie of Peterhead was presented with his membership card and a small token from the Party by local MSP Stewart Stevenson. 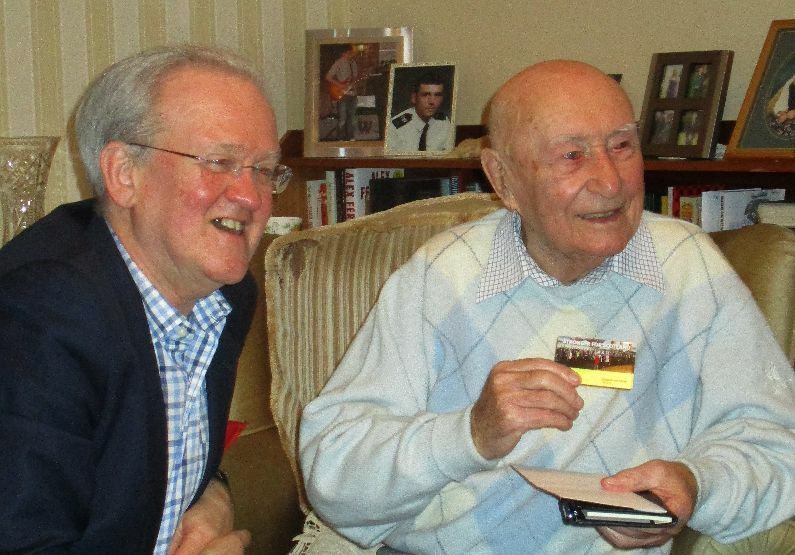 Mr Ritchie, who celebrated his 90th birthday last year, was a founding member of Fraserburgh Branch SNP and is the Honorary President of Peterhead Branch SNP. Mr Ritchie was also the Election Agent for the SNP at the 1964 General Election – the first time the Scottish National Party contested a Parliamentary election in Buchan. “Bob has been a stalwart of the SNP in Buchan for decades and an inspiration to many activists locally over the years. “It is fitting that his long service is recognised and I’m delighted to be able to present him with Honorary Life Membership from SNP Headquarters. “Bob holds a place in history as the first-ever SNP Election Agent in this area when the Party decided to contest the old East Aberdeenshire seat at the 1964 election. Bob tells a story that he narrowly avoided being the candidate at that election because he won the toss of a coin and chose to be the agent! “At that 1964 election, the SNP got 6% of the vote and 1900 votes. In May this year in Banff & Buchan, Eilidh Whiteford achieved a record 60% of the vote and over 27,000 votes. It is thanks to the hard work and dedication of people like Bob in those early days that the party was able to put down such solid foundations to build on locally. A Peterhead charity has benefitted to the tune of £400 from the decision by Banffshire & Buchan Coast SNP MSP Stewart Stevenson not to send out Christmas cards. Mr Stevenson has set aside the money he would have been spending on Christmas cards and postage to benefit local good causes in the constituency. The first of three local organisations to benefit is Age Peterhead. “Royal Mail still delivered my close family cards, but with the increase in local SNP membership, my signing arm would be worn out pretty quickly. So I am taking the money it would have cost me to send out these cards and putting it to good causes in Banffshire and Buchan Coast constituency. “The first worthy recipient is Age Peterhead. “Age Peterhead have a long history in the town, being founded in 1968 and have helped down the years with things like lunch clubs and – in the 1970s – coal distribution to OAPs. 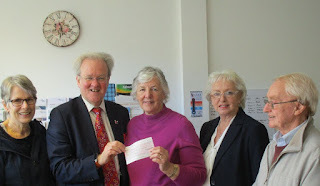 Now reformed as Age Peterhead and registered as a charity, the organisation provides information services, help with transport and operates two static caravans at Fochabers which are available to the elderly or infirm at attractive weekly rates for short breaks and respite. Banffshire & Buchan Coast MSP Stewart Stevenson has welcomed the launch of a new Post Office service to constituents in Rathen, near Fraserburgh. The Post Office Home Service has been introduced in response to the closure of the sub-Post Office at Rathen and the unavailability of alternative premises or a new sub-postmaster. “Rathen Post Office closed some time ago and was a much-valued service within the community. Despite the best efforts of the Post Office to find someone to take on the service from a new base, it has not been possible to find someone willing to do so. “This new service launched by the Post Office is the next best thing and will provide a lifeline service to Rathen, but particularly to those who may be elderly or inform, or who simply don’t have private transport to allow them to travel to their nearest Post Office. The Home Service is designed to provide customers living in small rural communities access to certain Post Office products and services. Customers who register for the Home Service can telephone the neighbouring Post Office Operator to order or request Post Office products and services, including stamps, mails acceptance, travel money and manual bill payments and have these delivered direct to their door during a designated delivery slot. The Operator of the Turriff Mobile service will provide this Home Service to Rathen. Customers wishing to use the new service should contact the Postmaster directly to register: The Operator of the Turriff Mobile service, c/o Turriff Post Office, 35 High Street, Turriff, AB53 4EA Telephone: 07767 832348. Pupils from Buckie Community High School (BCHS) and the local Regeneration Group have had their efforts to bring cinema back to Buckie recognised in the Scottish Parliament. Banffshire & Buchan Coast SNP MSP Stewart Stevenson has now tabled a Motion in Parliament congratulating the pupils at BCHS on their initiative and the local Regeneration Group who took the matter forward. The Motion has already gained cross-party support from SNP, Labour, Independent, Lib Dem and Conservative MSPs. The cinema showings – which started in November - were the culmination of a process started when three Modern Studies pupils at Buckie Community High School wrote to Mr Stevenson lobbying for Buckie to have a cinema once again. 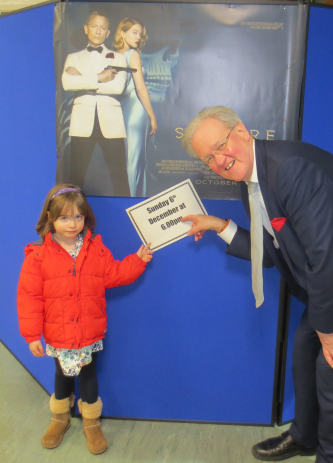 The SNP MSP took the matter up with Film Mobile Scotland, a company who bring cinema experiences to those communities without their own cinema, and director, Ian Brown stated he would be extremely interested in bringing this service to Buckie, but required the support of the local community to do so. Mr Stevenson then involved the Buckie Regeneration Group and local councillors Gordon McDonald and Sonya Warren, along with Buckie Community High School Rector Neil Johnston. As a result, Buckie film-enthusiasts have now been able to see top movies such as The Martian with Matt Damon and the latest James Bond film without having to travel to Elgin or Aberdeen. “This has been a real community effort in action and all those involved in bringing this project to this stage deserve huge thanks, but none more so that the Buckie High pupils who started the whole thing off by writing to me. The budget announced by Deputy First Minister John Swinney sets out a clear, Scottish alternative to austerity – protecting and reforming vital public services in challenging circumstances while supporting inclusive growth equip Scotland with the revenues needed to tackle inequality. As set out by John Swinney today, Scotland’s budget will provide additional funding for key public services like health and education – and will deliver an additional £90 million to build more affordable housing. Health board spending in Scotland is set for a £500 million increase – meaning total investment in the frontline NHS budget next year of almost £13 billion – which will support significant reform of Scotland’s health service to meet the challenges faced by an older population. Mr Swinney also made clear that Scotland’s frontline policing resource budget will be protected in real terms for every year of the next Parliament by a re-elected SNP government – providing a boost of £100 million over the period. In addition, household budgets across Scotland will be shielded from the effects of Tory austerity through the continued Council Tax freeze – the ninth year in a row it has been frozen, saving the average band D household around £1,500. “The budget set out by John Swinney is focussed on boosting economic growth and protecting our public services – setting out a clear, Scottish alternative to continued Tory austerity from Westminster. “Despite unprecedented cuts to Scotland’s budget, the SNP in government is delivering a £500 million boost to our health service to equip it to reform and deal with challenges posed by an aging population – and our frontline policing budget is set to rise by £100 million, helping our hard-working police officers keep our communities safe. “And the £90 million boost to investment in affordable housing is very welcome as we look to build on the progress made in recent years and deliver 50,000 new affordable homes over the course of the next Parliament. “That the Deputy First Minister has been able to deliver these boosts to investment in key public services and our housing stock is testament to the Scottish Government’s determination not to simply accept Tory austerity – and to take real action to take a new and better approach. Stewart Stevenson, SNP MSP for Banffshire & Buchan Coast, welcomes data showing that Scotland has the third highest youth employment rate in Europe at 54.6%. On Wednesday Mr Stevenson asked the Minister for Youth and Women's Employment, Annabelle Ewing, what data there is on how Scotland’s youth employment compares to the rest of the European Union. Mr Stevenson went on to ask the Minister what investment is being made to try and get Scotland’s youth employment figures to number 1 in Europe. “We invested £12 million last year and we have invested £16.6 million this year in embedding our developing the young workforce principles and policies. We have also provided more than 25,000 modern apprenticeship starts year on year, and some 101,000 modern apprenticeship opportunities have been delivered in the current parliamentary session. We have ambitions to go further and secure 30,000 modern apprenticeships starts by 2020. Stewart Stevenson, SNP MSP for Banffshire and Buchan Coast, highlighted this week the importance of health care accessibility for people in rural communities. During Tuesday's Scottish Government debate entitled ‘Redesigning Primary Care for Scotland’s Communities’, Mr Stevenson highlighted the need for more simplicity in the health service, commenting that it can be difficult for people to know who to turn to when they are feeling unwell. Banffshire & Buchan Coast SNP MSP Stewart Stevenson has welcomed a report from transport watchdog the Scottish Association for Public Transport (SAPT) on the benefits of a new rail link to Buchan. “The study area from Fraserburgh, Peterhead and Ellon to Aberdeen has poor public transport connectivity, and is particularly isolated from the national rail network compared with other comparable areas in Scotland. “The high growth in usage of stations at Inverurie (+450% since 2002), Dyce (+239% since 2002), and Laurencekirk (+40% since reopening in 2009) confirms that where train travel is appreciably faster than car travel, the rail service successfully generates a high level of usage and attracts modal shift from car. The Borders Rail Link has decisively confirmed the effectiveness of reintroducing train services where these can offer journey times competitive with or faster than car travel. “With the opening of the Borders Railway, Peterhead and Fraserburgh are now the towns of over 10,000 residents which are furthest from a rail station. “A line to a station at Ellon would be a very useful first step to getting Buchan back on track. Park and rail facilities there would benefit both commuters and vacationers. 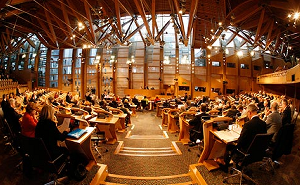 A majority of the Standards, Procedures and Public Appointment Committee takes the view that plans to include only face to face communication with Ministers or MSPs in a lobbying register is an artificial distinction, and recommends the Scottish Government reviews the potential impact of including all forms of communication in the Bill. 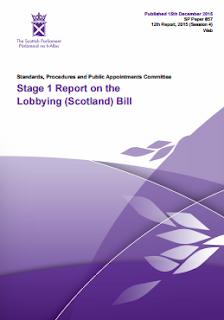 While the general principles of the Bill are endorsed in the Stage 1 report, the Committee also recommends that the Scottish Government considers bringing forward amendments to broaden the definition of regulated lobbying to include communications with other public officials, as well as Ministers and MSPs. “The Committee listened carefully to those giving evidence to the inquiry, and as a result, the majority view is that the Government should consider broadening the coverage of the Bill in key areas. “The Committee understands that the definition of lobbying was restricted to oral communication in order to focus the scope of information to be captured and to produce a low burden, light touch regime. “Nevertheless, the majority view is that restricting registration to oral communications is an artificial distinction which could leave a great deal of information unregistered. The Committee’s report also notes concern about the workability of exclusions in the Bill for meetings initiated by MSPs or Ministers. The Committee asks the Government to re-examine the practicality of this and consider removing or replacing at Stage 2 of the Bill. 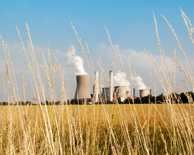 The SNP is today calling for the UK government to clarify its position on carbon capture and storage (CCS) after Tory Energy Minister Lord Bourne hinted that investment might be back on the table. Only two weeks after Chancellor George Osborne pulled the plug on developing the significant £1 billion clean energy project at Peterhead, the Conservative peer – a UK Government Minister in the Department of Energy and Climate Change – has revealed he is working on a new plan to develop CCS. “Just two weeks ago the Treasury leaked to the stock markets their decision to scrap £1 billion investment for CCS in Peterhead. George Osborne didn’t even have the backbone to announce this latest betrayal of Scotland’s energy in the House of Commons. “And despite being told that the vital project had been killed off, along with the 600 jobs it would have created in the North East, a Tory minister has this week briefed that he’s dreaming up a new plans to pursue carbon capture technology. “Why on earth the UK Government is going back to the drawing board when plans for Peterhead had reached such an advanced stage beggars belief. “We’ve had rank hypocrisy from David Cameron posturing in Paris – extolling Britain’s climate change credentials, while his government is scrapping pioneering green energy technology back here in Scotland. Following a ministerial update on the Common Agricultural Payments (CAPS) Stewart Stevenson SNP MSP for Banffshire & Buchan Coast, asked Cabinet Secretary for Rural Affairs, Food and Environment, Richard Lochhead about potential delays to payments. The Minister responded explaining that some payments could be delayed in the coming months but that resources were focussed on minimising the effect on any other payments. SNP MSP Stewart Stevenson has today welcomed cross-party support for his parliamentary motion condemning the UK Government’s decision to cut £1 billion in funding for the carbon capture and storage project in Peterhead – but has expressed disappointment that the Scottish Tories have thus far refused to stand up for the North East and back the motion. The motion lodged by the Banffshire and Buchan Coast MSP last week has now been signed by MSPs from the SNP, Labour, the Liberal Democrats and the independent grouping in the Scottish Parliament – leaving the Tories as the only parliamentary group yet to lend their support. “The carbon capture project would have been a major boost for the North East, creating 600 jobs and helping Scotland to become a world leader in clean energy – and I am delighted to see cross-party support in the Scottish Parliament on this important issue. “It is disappointing that the Tories have thus far not saw fit to sign the motion and stand up for Scotland’s energy industry – that the two Tory MSPs for the North East in particular have failed to do so shows that they are more interested in standing up for the UK Government than in standing up for their constituents. “The UK Government has swindled Scotland out of £1 billion while posturing as environmentally friendly on the world stage – and people in Scotland won’t be quick to forgive or forget this latest betrayal. Stewart Stevenson, SNP MSP for Banffshire and Buchan Coast, is encouraging Scottish fishing communities to apply for their share of €107million (£77million) funding. The programme will open to applications on 18 January and will run until 2020. Stewart Stevenson, SNP MSP for Banffshire & Buchan Coast, has welcomed the replacement of the Forth Road Bridge which is on schedule and under budget. SNP MSP Stewart Stevenson has today called for cross-party support for his motion calling for the UK Government to re-think their decision to cut £1 billion in funding for the carbon capture and storage project in Peterhead. The Banffshire and Buchan Coast MSP has lodged a motion in Parliament expressing concern at the decision, which could cost up to 600 jobs in the North East – and has called for North East MSPs of all parties to join him in condemning the UK Government’s decision and to stand up for the energy industry in the region. “The carbon capture project would have been a major boost for the North East – creating 600 jobs and helping Scotland to become a world leader in clean energy. “The UK Government’s decision to abandon the scheme is just the latest example of their complete disregard for our energy industry – and it’s right that North East MSPs from across the parties join in condemning this cut. “During the referendum, Labour, Tory and Lib Dem politicians lined up to tell us that the only way to guarantee this funding was to vote No – given their broken promises, it’s now vital that they do the right thing and take a stand in condemning this damaging decision by the UK Government. “The Tory government has swindled Scotland out of £1 billion while posturing as environmentally friendly on the world stage – and people in Scotland won’t be quick to forgive or forget this latest betrayal. Local SNP MSP Stewart Stevenson has commended the fishing industry for its approach to stock management during a debate on fisheries in the Scottish Parliament on Thursday. “Our fishermen are absolutely to be commended for the way in which they have risen to the challenge of stock management, often in the face of total misunderstandings of science and totally ineffective and uninterpretable regulation. “We have an issue not just in catching fish and the regimes that surround that but in fish consumption levels, which are pretty static. We have not seen much increase in fish consumption, despite the fact that our processing and catching industries continue to grow and become a more valuable component of our economy. Banffshire & Buchan Coast MSP Stewart Stevenson and Banff & Buchan MP Dr Eilidh Whiteford attended a ceremony held at Peterhead Harbour to commemorate the 150th anniversary of the lifeboat station. At the ceremony, Trustee of the RNLI Vice Admiral Sir Tim Laurence presented Peterhead Lifeboat Station with a vellum to mark the anniversary. “It was a pleasure and a privilege to be present at the ceremony to give thanks for the many lives saved by the Peterhead Lifeboats over the years, and to pay tribute to the crews both past and present. 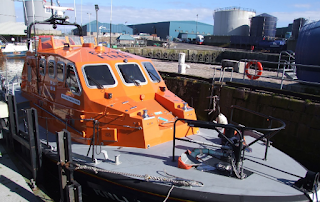 “During the fisheries debate in the House of Commons this week, I began my remarks by expressing my thanks to the men and women who crew our lifeboats in Fraserburgh, Peterhead and Macduff in my constituency. They are volunteers who risk their lives in all weathers to keep others safe. Stewart Stevenson, SNP MSP for Banffshire & Buchan Coast, has welcomed developments made by the Public Petitions Committee in progressing school bus safety. The School Bus Safety petition was originally brought to the attention of the Scottish Parliament by Gardenstown resident Ron Beaty following an accident in 2004 when his granddaughter was knocked over by a vehicle getting off a school bus. Mr Stevenson has previously congratulated Ron Beaty calling him a “ferocious champion of improving safety in our school transport system.” and on Tuesday the Public Petitions Committee members discussed the School Bus Safety petition and agreed to write to the Department for Transport regarding the petition. The “Evaluation of Glasgow’s School Bus Signage Pilot” final report found that enhanced signage was more visible and noticeable to drivers than the statuary minimum signage and that the addition of flashing lights appeared to have a significant impact on drawing attention to the bus. Following the Chancellor’s decision to cut public funding for political parties in the House of Commons, the SNP has called for him to abolish so-called Cranborne money for opposition parties in the House of Lords. The Chancellor announced in his Autumn Statement that ‘Short Money’ for political parties in the House of Commons would be reduced by 19 per cent. 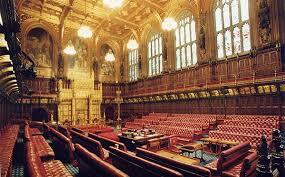 However, he has not announced a similar cut for opposition parties represented in the Lords. Cranborne money is provided to the Labour, LibDem and Crossbench groups in the House of Lords, and is intended to pay for staff and office expenses. Total funding for opposition parties in the Lords is set to increase to £924,989 this year – an increase of 46 per cent since 2010-11. “People will find extraordinary enough that members of the House of Lords are spending almost £1 million for assistants but for this ‘Plush Fund’ to be protected by George Osborne while imposing austerity cuts on public services. “Surely if funding to support democratically elected representatives in Parliament will be cut, there can be no justification for protecting spending on unelected and unaccountable peers. The Tories are fond of saying that ‘we are all in this together’ – clearly this does not include their colleagues in ermine robes. Stewart Stevenson, SNP MSP for Banffshire and Buchan Coast, highlighted this week the serious health implications of using nicotine. In Tuesday's Scottish Government debate on the Health (Tobacco, Nicotine etc. and Care) (Scotland) Bill Mr Stevenson spoke about the serious health problems which arise from the misuse of Tobacco and Nicotine. The Bill was brought forward by Shona Robison, Cabinet Secretary for Health, Wellbeing and Sport on the 4th July 2015 and will introduce measures to limit exposure to smoking and to limit the prevalence of smoking behaviours. It will also require health and social organisation to inform people when they have been harmed as a result of the care or treatment they have received and will introduce criminal offences for ill treatment or wilful neglect. “The Bill that is before us addresses the advertising and promotion of nicotine vapour products. I welcome restrictions on those products because, although they are certainly known not to carry many of the chemicals that are present in cigarettes and that cause ill health and death, they have nonetheless not yet been shown to be entirely safe to be sold. The UK Government’s ‘rank hypocrisy’ on clean energy has been exposed again today – after David Cameron’s speech on climate change in Paris yesterday contrasted with his decision to cut £1 billion in funding from a vital carbon capture project in Peterhead. During the Paris climate talks, David Cameron said that instead of making excuses to future generations, “we should be taking action today”. This is despite his government cutting a £1 billion grant which could have created 600 jobs in Peterhead while helping Scotland become a global leader in clean energy technology – which was promised in the 2015 Tory manifesto. “For David Cameron to try and lecture others on the environment just days after his government’s decision to cut the CCS funding in Peterhead is nothing less than rank hypocrisy – something which we’re getting all too used to from this Tory government. “The Prime Minister may enjoy posing with world leaders and posturing as environmentally friendly on the international stage – but people in Scotland can see through his empty, vacuous words and will instead judge him on his actions. “David Cameron says that we should be taking action on climate change today – and he’s right. Unfortunately, the only real action he’s taken in recent times has been to cut a vital clean energy project in the North East of Scotland.